Good flight. A ramp overpass calibration was flown at 2000 ft AGL at the start of the mission. This was a repeat flight from previoius years, designed to assess dh/dt of several glaciers draining into the Larsen-A, -B, and -C embayments. All the science instruments performed well. Weather was excellent with some minor cloud coverage. The aircraft came back with two writeups. Postflight replaced a bid wire on the #2 fuel pressure gauge to repair that. Also, did some work on the landing gear handle resistance writeup. Both checked good for flight. This is a repeat flight, designed to assess dh/dt of several glaciers draining into the Larsen-A, -B, and -C embayments. From north to south, these glaciers are the Drygalski, Hektoria, Crane, Melville, Starbuck, Flask, Leppard, Attlee, Gould, Demorest, Gibbs, and Weyerhauser. 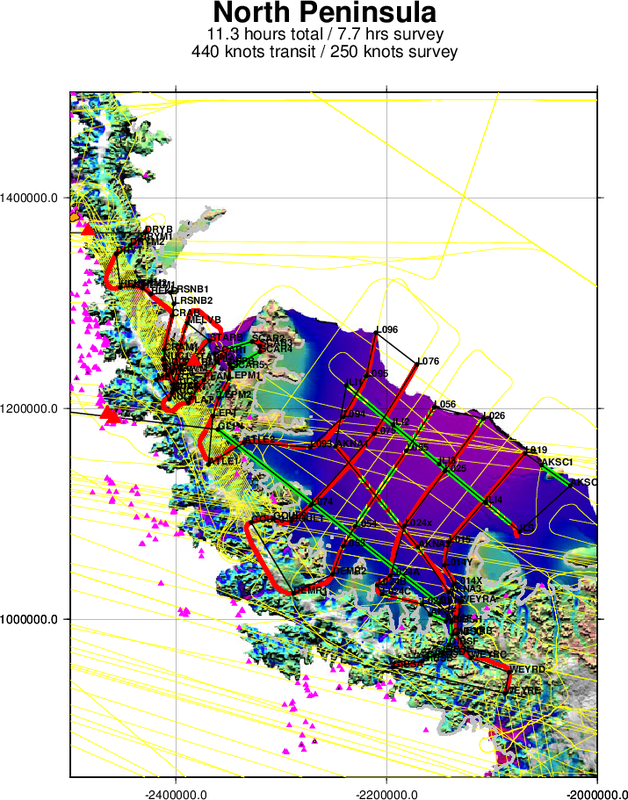 In addition to these glaciers, we repeat two lines over Scar Inlet, several flowlines on the Larsen-C Ice Shelf, and four north-south tie lines over the Larsen-C, including overflights of three AWS stations and several areas of stagnant ice so that contributions of surface processes to dh/dt can be assessed independently of dynamic processes. 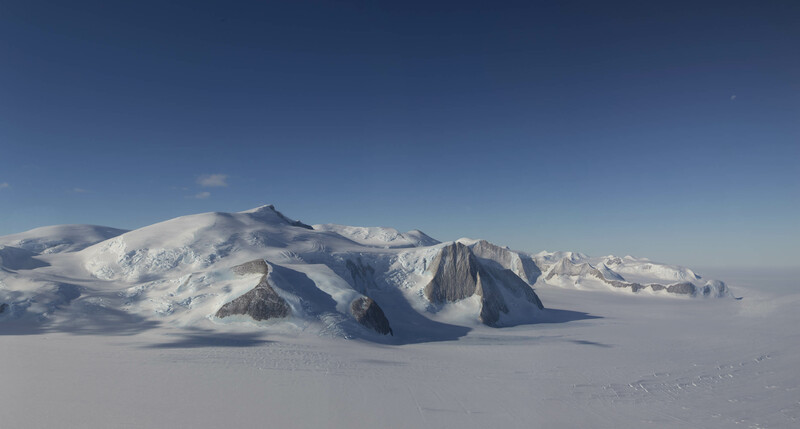 Finally we overfly the Gipps (in the south) and Bawden (north) Ice Rises on the eastern edge of the Larsen-C, since these may contribute to the stability of the ice shelf. The Antarctic Peninsula has some of the most difficult weather on the entire Antarctic continent, and this season has been no exception. It also happens to fall in a part of the continent where little or no high-resolution weather satellite imagery is available during our morning flight decision window. This forces us to rely almost solely on forecast models for this region, which often do not perform well there because of the complex terrain. This morning we had the benefit of one rather limited, though positive, weather satellite image, and of several positive forecasts which we have had several weeks to compare with imagery to assess their fidelity under a variety of circumstances. The forecasts showed a cessation for today of the strong westerlies that typically blanket the Peninsula in cloud due to orographic uplift, as well as light foehn winds on the lee side which we expected to keep the Weddell Sea coastal fog at bay. 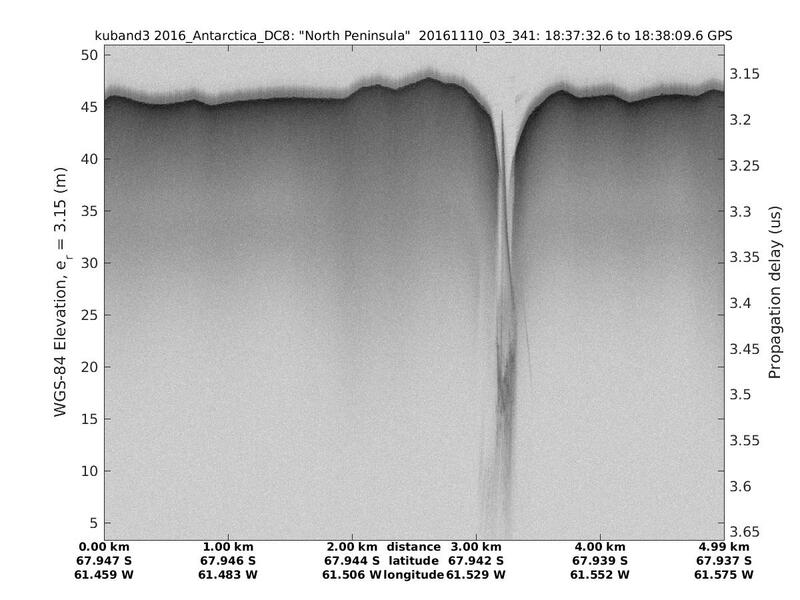 We encountered the clear and calm conditions we expected, losing only small amounts of science data at a few spots on the ridgeline, and near the calving front of the northern Larsen-C ice shelf, where we encountered a few clouds. All instruments performed well, with the exception of the FLIR camera. The FLIR encountered a data system settings issue which resulted in the loss of all data from roughly the first half of the mission. We do not expect a repetition of this particular problem. We conducted a ramp pass at 2000' on departure.